The cover of The Delines’ new album, The Imperial shows a solitary automobile – one of those mid-70’s Yank jobs, a bit like a Cadillac Seville – parked up against a rather austere apartment block in what is an otherwise vacant lot. The image is a striking metaphor for the stories that lie within the record’s sleeve; tales of abandonment, loneliness, desperation and social isolation from America’s more battered and bruised underbelly. The Imperial’s cover photo, though, could equally relate to Amy Boone having been seriously injured in March 2016 when she was hit by a car whilst walking through a parking lot in Austin, Texas. The band’s lead singer sustained extensive damage to her legs as a consequence of this accident. Her walking on stage tonight with the aid of a cane reflects her ongoing physical recovery from this horrific experience. Amy Boone’s injuries and subsequent convalescence delayed the release of The Imperial, the second album from the Portland, Oregon-based band. Work on this record had commenced before her accident but wasn’t completed until late last year. The Imperial eventually came out earlier this month to universally rave reviews. As a further consequence of Amy Boone’s incapacity, The Delines were out of live action for almost three years. Their first gig thereafter was just before last Christmas, a suitably low key affair in a pub in their home town. But they are now back out on the road, though, on a 16-date tour of the U.K. and Ireland. 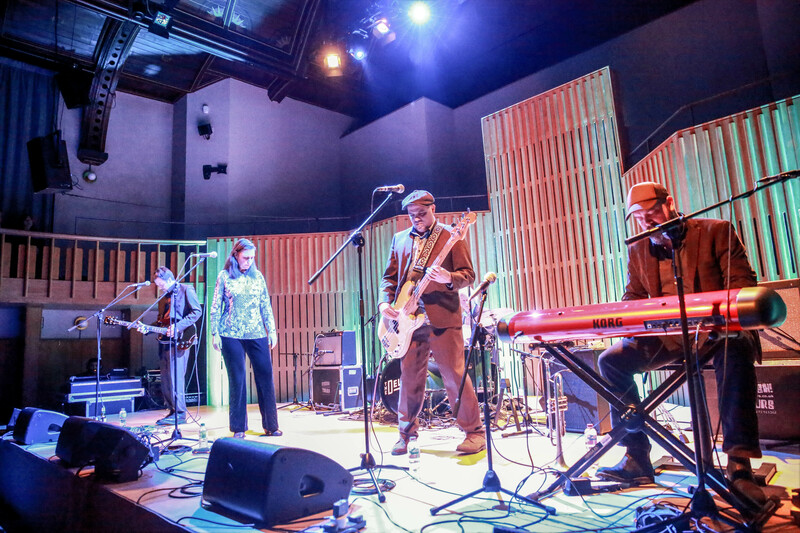 And tonight’s show in what Amy Boone rightly describes as the “warm and special” atmosphere of the Howard Assembly Room proves The Delines’ enforced absence has not diminished any of their unerring ability to accurately convey desolation and empathy through the medium of their sublime sound. For twenty years Willy Vlautin was the frontman of the alternative country band Richmond Fontaine until their dissolution in 2014. He still writes those exquisitely sad songs but nowadays is far happier to hear Amy Boone sing them. And her voice is the perfect vehicle for his poignant narratives about the downtrodden and the defeated. Boone invests these songs with even greater anguish and despair, emotions that you feel will have been magnified by her own traumatic experiences over the past three years. But The Delines are a band and would not be complete without two of Willie Vlautin’s fellow Fontaine alumni Sean Oldham and Freddy Trujillo, on their respective drums and bass guitar, and Cory Gray on keyboards and trumpet. And together the five musicians give us The Imperial in its entirety plus a clutch of older songs including the first two encores, ‘The Oil Rigs At Night’ and ‘Colfax Avenue’, in what is an absolute masterclass in effortless, elegant country soul.